A swift, richly featured chess engine for Mac. Developer website: Applied Computer Concepts Ltd.
Is there a better alternative to HIARCS chess engine? Is HIARCS chess engine really the best app in Card and Board category? Will HIARCS chess engine work good on macOS 10.13.4? HIARCS is clearly the strongest chess software for Apple Mac computers. 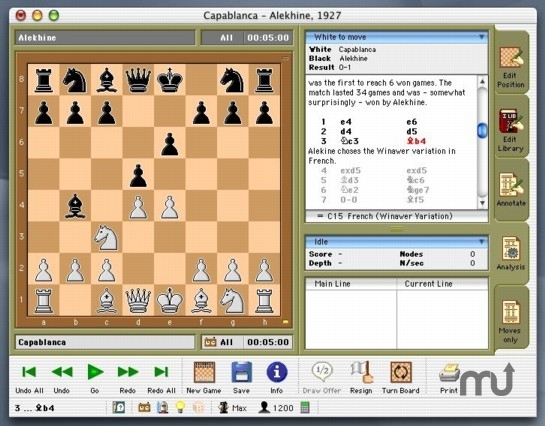 We have combined this engine with the latest high quality Sigma Chess 6.1.4 GUI to produce the strongest and best-featured chess software for the Apple Mac. This gives Mac owners the strongest chess engine ever and best features for chess play and analysis on both Intel and Power PC (G3/G4/G5) Mac computers with the full world championship strength single and multiprocessor/core chess engines. The HIARCS 11 chess engines can also be used with other good chess GUIs on the Mac like Shredder, Jose and Scatha. HIARCS chess engine needs a review. Be the first to review this app and get the discussion started! HIARCS chess engine needs a rating. Be the first to rate this app and get the discussion started! Sigma Chess now support engine-engine matches and multiPV display! 240 Elo stronger than HIARCS 10 on Intel based Macs Now can reach 2900 Elo on fast hardware - World Champion strength!